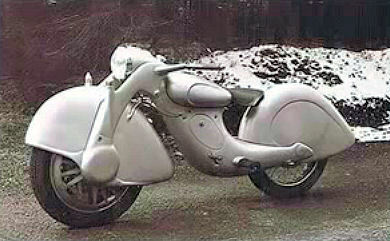 The Killinger and Freund Motorcycle was an attempt in 1935 by a group of five German engineers from Munich to design a more streamlined and modified version of the German Megola front-wheel drive motorcycle. The work took three years to complete but the result was impressive. The Killinger and Freund motorcycle featured a three cylinder two-stroke engine built right into the front wheel, transmission and clutch, with more comfortable front and rear suspension. This design was intended for civilian production but the start of World War II cancelled those plans. The article seems to suggest that "only" 110kg of unsprung weight at the front (actually there would have been more) is a good thing. Unsprung weight is the enemy, in particular the ratio of sprung to unsprung weight is something that engineers try to maximise. So taking weight that is usually sprung and making it unsprung is just about the worst thing an engineer could do. I'm not surprised there was only one prototype.